India is a place of vibrant colors and sensory overload, where delicate flavors intermingle with robust history and you couldn’t feel further from home. 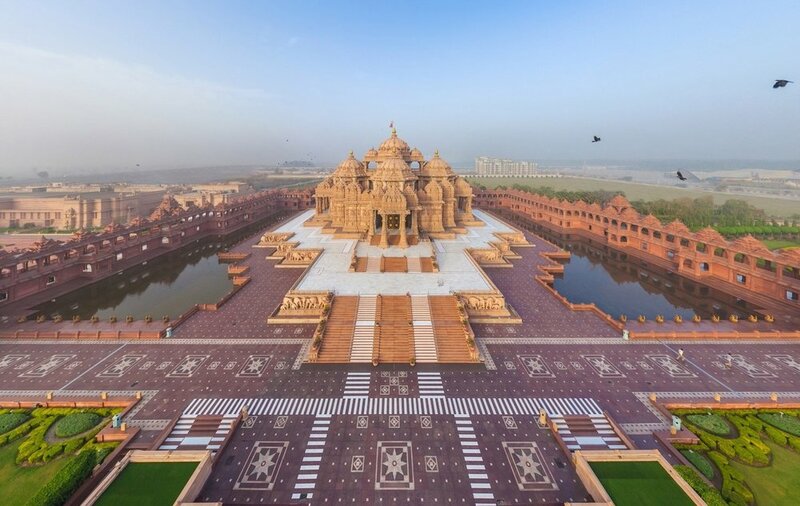 This is why we love India, and why it’s at the top of our travel list for 2019 and beyond. Perfect for those looking for a balance of culture, architecture, and history, there is simply no better destination. Built with the first-time India traveler in mind, this 13-day trip takes you through the capital of India and on to the world famous Taj Mahal, then to Ranthambore National Park where you’ll get to learn the ways of the jungle as you seek out the elusive Bengal tiger. 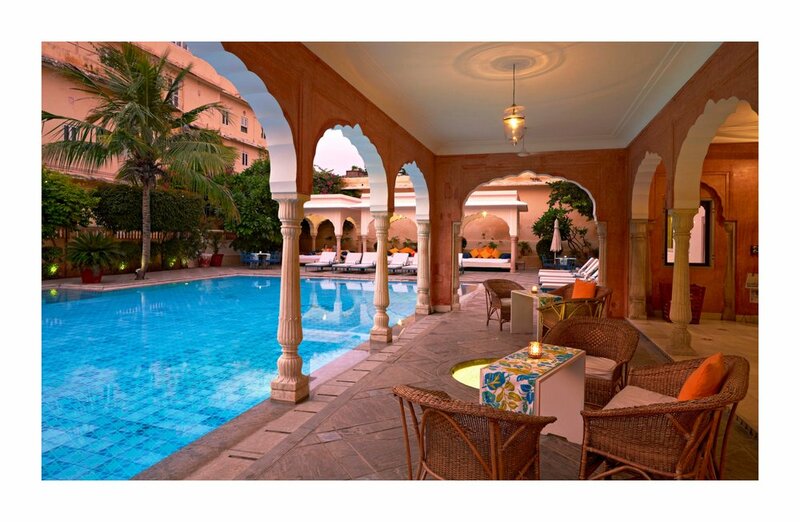 Then, carry on to Jaipur where flavorful markets and rickshaw rides await, before heading to the gorgeous “Sun’s Fortress” where a once-in-a-lifetime equestrian opportunity is available to those with horse savvy. You’ll finish the adventure off with a stopover in Udaipur, where exploring palaces by boat and walking through museums cast in marble serves as the perfect cherry on the top of an incredible curated week in India. As always, this itinerary is perfectly customizable to the desires of you and your traveling companions. We can’t wait to help design your perfect trip to this epic destination! The perfect first-time itinerary to India with culture, wildlife, and great food throughout. 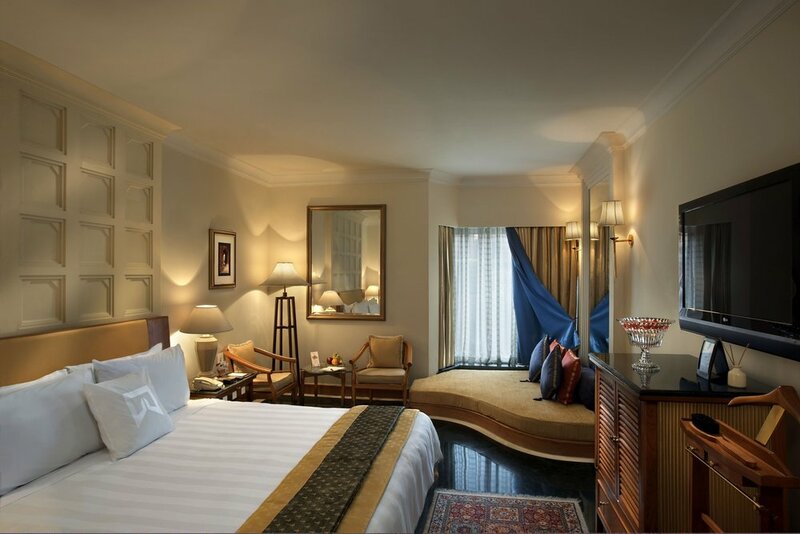 On your first day in India, arrive in Delhi and get settled into your accommodation for next two nights, The Imperial. Chances are you’ve had a long flight and will appreciate the rest! The next morning, wake up and enjoy breakfast before going sightseeing in the walled city of Old Delhi. This colorful and vibrant place was built by the mighty Mughal Emperor Shah Jahan, and is overflowing with heritage. You’ll also get to visit India’s second largest and most aesthetically designed mosque, the Jama Masjid. Afterward enjoy the flavors of the spice and jewelry markets (some of which are 350 years old), walking on foot alongside the stalls and occasionally hopping on a rickshaw to discover hidden gems in narrow alleyways. The following day, you will transfer to Agra, a city established in 1475 AD and home to the Taj Mahal. 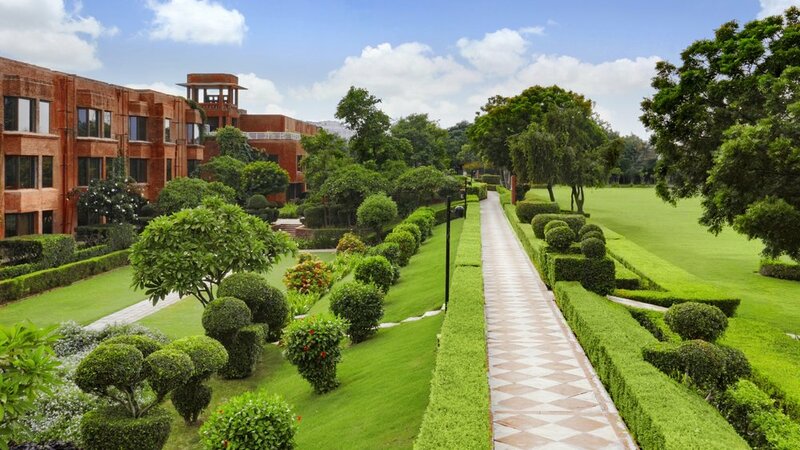 You’ll arrive just in time for a sunset visit to the world-famous monument from Mehtabh Bagh, the Moonlight Garden. 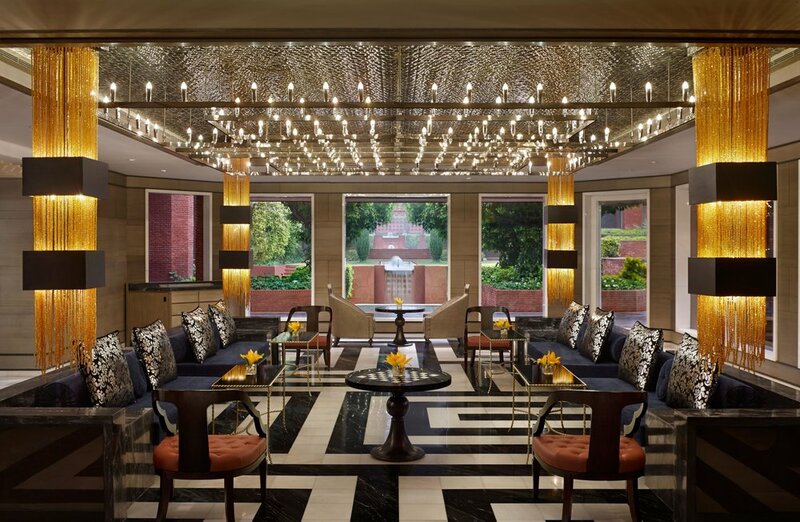 Check into the ITC Mughal for a restful night before arising on day four to view the Taj Mahal the next morning with different light. After photographing and taking in the Taj Mahal in the early morning, enjoy breakfast at a local spot called Sheroes Cafe. Operated by five women who are the survivors of acid attacks, this is a wonderful way to inject a little more cultural knowledge into your morning coffee. That afternoon, you’ll drive to Ranthambore, situated in eastern Rajasthan where the Aravali Hills and Vindhyan plateau meet. Here, the Ranthambore National Park is one of the most accessible Bengal tiger reserves in India. Tuck into your accommodation for the next two nights, Khem Vilas, after a long and exciting day. The following morning, arise at dawn when you’re more likely to see big cats on the move. This experience will be much like our African safaris, with quick coffee and biscuits before you clamor aboard a safari vehicle with a guide. Hopefully you’ll catch a glimpse of these elusive and powerful felines! On your return, enjoy a full breakfast and time at the pool, where you might take a cat nap of your own. That afternoon you’ll go out again to see the jungle (and hopefully a few tigers and perhaps a leopard, hyena, jackal, sloth bear, and many more creatures) during magic hour as the sun begins its descent across the sky. On day six, it’s time to depart for Jaipur, the “Pink City.” You’ll witness the landscape change, going from lush to arid as you near the dry lakebed foundation of the city. 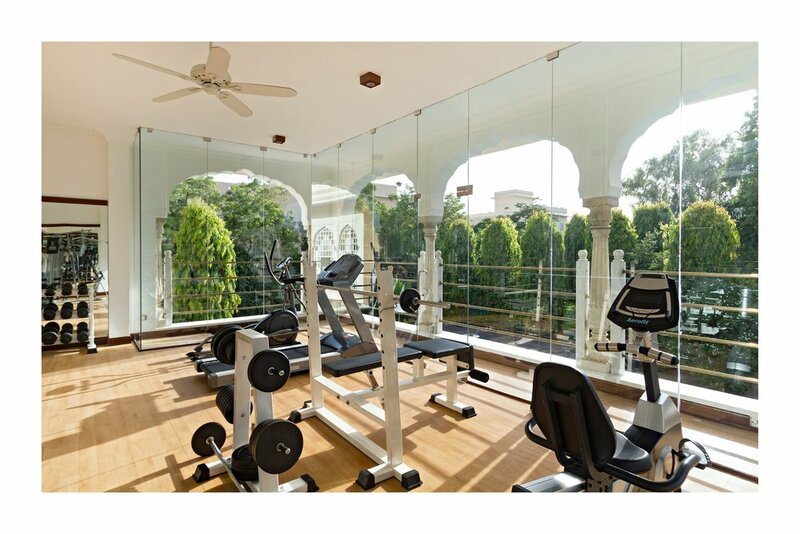 Get situated at your hotel for the next three nights, Samode Haveli. The next day you’ll have a great opportunity to explore the hidden corners of Jaipur. After breakfast, visit the magnificent and iconic Amber Fort before jumping in a rickshaw for a custom tour that will take you through an interesting socioeconomic map of the city. That afternoon, indulge in the many flavors and incredible handicrafts of India as you blend in with the locals at the markets, sampling sweets and watching as artisans design jewelry right before your very eyes. The following day, you have the option to experience Jaipur from a birds-eye-view in a hot air balloon. You will get to fly over the oldest mountain range on the planet, the Aravallis, for a once-in-a-lifetime adventure. Prefer to stay on the ground? Explore the inner city on foot, passing through pink stucco walls to vibrant markets to grand palaces loaded with rare treasure. You’ll even get to visit the observatory that has the largest sun dial on the planet. The details of the architecture and the little interactions you experience during the day are truly what make this such a cool experience. 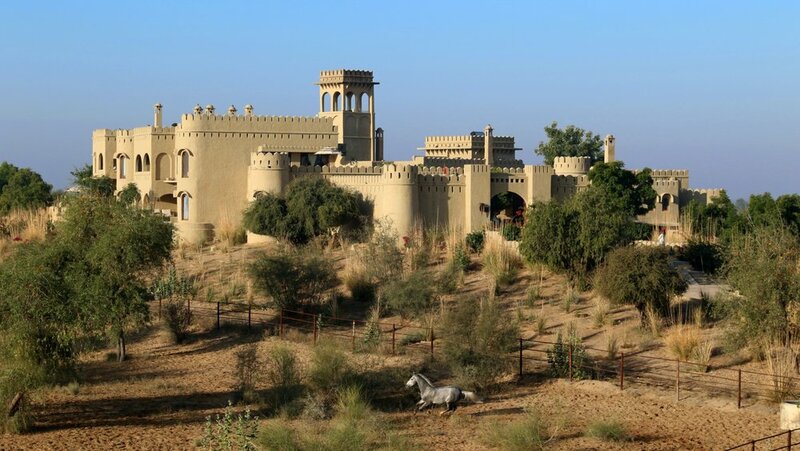 On day nine you’ll journey to Mihir Garh, literally translated as “Sun’s Fortress.” This beautiful 9-suite fantasy fort in the Thar desert features private plunge pools, Royal Picnics, and Marwar horse-riding. You are in for a treat and many options over the next two days! That evening if you so choose, elect to have an exclusive Shikar Dinner organized just for you. You will feast on a traditional Indian barbecue surrounded by a blanket of starlight with a crackling bonfire nearby. The next day is also optional: take advantage of the Mihir Garh Equestrian Program. These horses are specific to India and are the pride of the property. Go for a day ride and enjoy a royal picnic lunch or breakfast, depending on your wishes. (Only suitable for experienced riders.) For those who would rather skip this portion, you’ll get to enjoy a lunch with a local family in Jodhpur. That evening, there is another optional private tour of the stunning Mehrangarh Fort. For those who enjoy art and history it is very special to see the Fort at your own pace and without interruption. On the following day, you’ll depart for Udaipur, often referred to as “the Venice of the East.” With lakes and green forested hills all around, this city looks and feels much different than Jaipur. 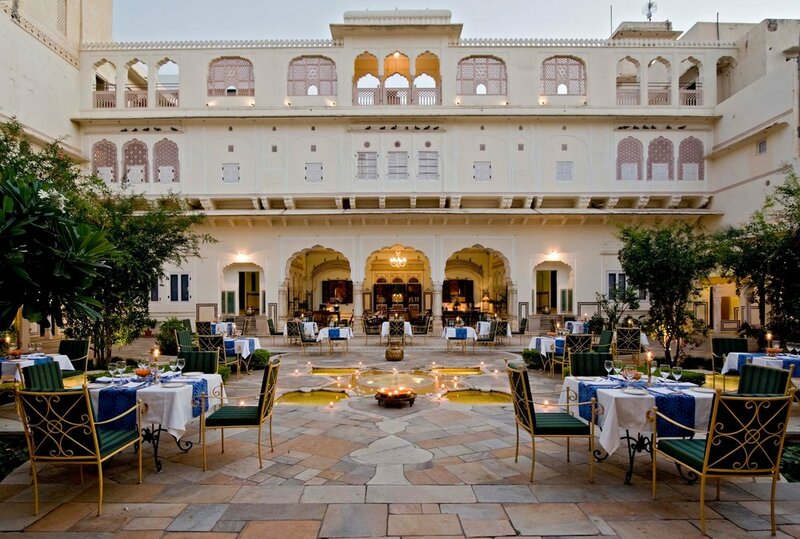 You’ll be spending your final days traveling here in Udaipur, staying at the Leela Palace. After checking in, visit the Jag Mandir palace by exclusive boat tour. The next day, you’ll sightsee the city palace and beyond. Gorgeous temples, marble and granite walls, and local artisans will again pepper your meanderings as you enjoy the sights and learn about local traditions and customs that give meaning to the intricacies of life here in Udaipur. On your final day, enjoy one last breakfast before flying back to Delhi and on home.